How much change is in a vending machine? There is only one way to find out – all you need is a giant pile of money and a vending machine that sells soda for $1.25: If you put in a dollar note and press the “return change” button, you will get the dollar note back directly. If you put in two dollar notes (the maximum it takes) at a time, it will give you change for the two dollars. Our machine had $29 of change. 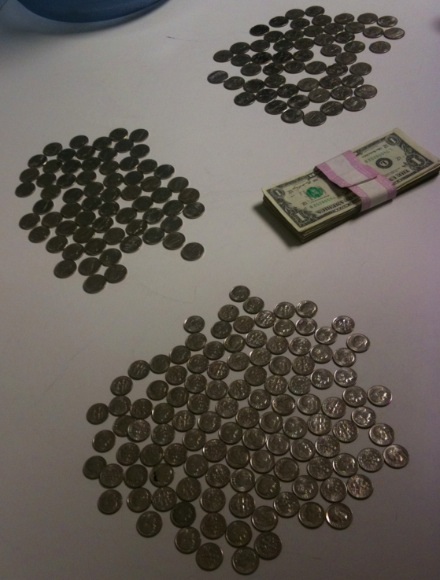 It started out with 25¢ coins, and after a while returned a combination of different coins (25¢ & 10¢, then 10¢ & 5¢), finally switching to all 5¢ coins at the end. After this, the machine refused to take bills, so it was either full with bills or, more likely, out of change. But actually, it might still contain up to 95¢ of change – today’s homework is to find out how to measure the remaining change in the machine! This entry was posted in hacks, puzzle on June 23, 2010 by Michael Steil. Didn’t anyone look at you strangely while doing all that? (Anyway, all the vending machines I’ve seen seem to hold your money separately before vending, or refunding. AFAIK vending machine don’t give out customers coins at all. If a customers insert bogus money and the machine accept it, its just a loss situation for the vending machine owner. If the machine gives a customer bogus money (e.g. from another customer) the vending machine owner is liable. So vending machine only returns your money at all without any products or change given to you or the machine gives back controlled and trusted change. Our vending machines at work are a bit temperamental. I work in a school, and they like to eat money without even registering it ever went in. The staff vending machine this afternoon took my 50p coin, gave me a 25p drink and spat out 45p in change which was quite nice. Normally it takes my 50p, fails to vend a cup and sprays hot chocolate on the floor then gives me 25p change. In a previous job I quickly discovered the vending machine would give a free product if I kept hitting the coin return button during the vending cycle. … then it gave the money back too. I did a part time job while studying, and I had to program a similar system. All the coins of one type are put in something called a “hopper”. If you enter new coins, they fall into the hopper. If the system wants to give money back, it gives money from the hopper. The hopper in that machine I worked on back then was very similar to the way German “Lotto” machines work: It has a belt which just gets ANY coin out of the hopper and throws it out. Thus, you do not really “cycle” in a strictly sense through all the coins, but the coins you put into and which come out are not same. Put in $2, buy a drink; if it returns < 75c, now you know. If it returns 75 c, put in another $2, buy another drink; easy. Also, there is obviously more than one way to find out; yours is just the cheap quick easy way. The expensive thirsty way is to keep buying drinks for $2 until you stop getting change. @Piku: what I’d like to know, is what drink costs only 25p? @Scott But the machine isn’t accepting bills now. Keep buying sodas for $1.30, (4 quarters, 3 dimes) until you stop getting nickels back. Hey, you’ve got enough change sitting around. Get the owner to open the machine. Try increasingly granular. Buy with two $1 bills until no more, then use only quarters, then only dimes, finally only nickels. At that point youâve either broken the machine or it no longer has anything to dispense. How did you manage to receive 29$ of change by putting two dollars in at a time? Our local chips & cookies dispenser claims to accept up to 100$ bills, I didn’t have any on hand to try but it did redeem a 5$ bill in coins. It also exhibits the same behavior as your machine: when you insert coins, the ones it gives back are not the same ones that were inserted.